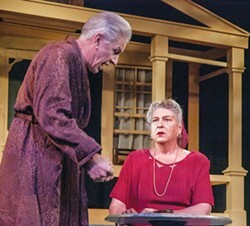 Brad Harrington and Leira Satlof in All My Sons. Don't hold Eleemosynary's title against it. 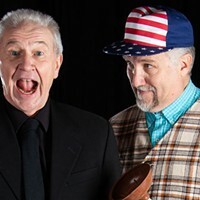 It's a clever device by playwright Lee Blessing (whose Going to St. Ives was a popular production at Redwood Curtain Theatre last year) that plays into the content of the piece. It means "charitable" and it is the winning word in a national spelling contest. Eleemosynary, now playing at Humboldt State University, explores with exceptional depth, given its scant 75-minute running time, the relationship between three independent but inextricably bound women: Dorothea (HSU theatre, Film and dance faculty member Rae Robison), her daughter Artemis (Megan Johnson, last seen in Five Lesbians Eating a Quiche at Redwood Curtain and Robison's real-life daughter) and Artemis' daughter Echo (HSU student Isabella Ceja, most recently the Green Snake in Ferndale Rep's The White Snake). The storyline weaves back and forth between the present, in which Dorothea has suffered a stroke and Echo has won the aforementioned spelling contest, and the past, in which Artemis leaves her young daughter to be raised by Dorothea as she attempts to build her own life. All three women have problems communicating with one another, which both pulls them apart and hints at ways they might come back together. Dorothea, frustrated by the social norms of her youth that prevented her from developing a career, decides instead to be a professional eccentric with a new approach to human-powered flight. Artemis naturally focuses on career over motherhood, resulting in losing touch with her emotional life and only communicating with her child through stilted, unemotional telephone conversations. Echo, caught between the two, channels everything into a fixation on dissecting and spelling obscure words, devoid of any real-world context; after her grandmother's stroke, she insists she can still hear the mute Dorothea speak. All three actors deliver masterful performances: Robison is a delightfully acerbic yet fanciful Dorothea, Johnson personifies the emotional challenges of seemingly obligatory feminism and Ceja moves effortlessly between loving grandchild and obsessively competitive teen without skipping a beat. The spare set and lighting by Jared Sorenson allow the audience to focus on the characters, and director John-Michael Wilkerson deftly guides the actors back and forth through the intersecting arcs of their lives. Co-produced with North Coast Repertory Theatre, Eleemosynary is an intriguing exploration of cause and effect, brought to life through a shared quest for female extraordinariness. Eleemosynary runs through Feb. 4 at Gist Hall Theatre and benefits the KCACTF Theatre Club. Call 826-3928. All My Sons, now running at Ferndale Repertory Theatre, was Arthur Miller's first commercially successful play, capturing the zeitgeist of post-World War II America. Based on actual events, All My Sons traces the arc of self-made businessman Joe Keller (Brad Harrington, in a finely nuanced performance), who secretly made a bad decision for what he believed was a good reason, and the gradual disintegration of an unconscious conspiracy of silence that changes the family forever. By 1947, Joe has papered over the cracks of that decision, which involved the provision of cracked cylinder heads to the Air Force and the subsequent deaths of 21 pilots, and built a successful business. But the war lingers on in the mind of his wife Kate (a powerful and heart-wrenching performance by Leira V. Satlof) as a result of the still-unexplained wartime disappearance of their son Larry. Kate's hopes are kept alive by neighbor Frank Lubey (a delightfully unaware Steven Carter), who is preparing Larry's horoscope for the day he disappeared. The cracks begin to break through when Ann Deever (an almost-perfect interpretation of post-war proto-feminism by Kaitlen Osburn, marred only by an unfortunate wig) arrives for a "surprise" visit engineered by second Keller son Chris (Christopher Kehoe, convincingly running the gamut of emotions from pride to confusion to guilt and despair), who wishes to propose to her. But all will not be plain sailing, as we discover that Ann is not only the one-time girlfriend of missing son Larry but also the daughter of Joe's original business partner, who took the fall for that bad decision. To accept this, Kate would have to accept that Larry is dead. Meanwhile, status- and money-obsessed neighbor Sue Bayliss (a wonderfully snarky Natasha White) reveals to Ann that the entire neighborhood believes Joe to be guilty in the deaths of those 21 pilots. When Ann's brother George (an edgy and tightly wound Victor Howard) arrives, fresh from a visit to their father in prison, the Keller family begins to unravel in earnest. Rounding out the excellent cast are Dillon Savage as Sue's long-suffering husband Dr. George Bayliss, Greta Turney as Frank's wife and George's one-time sweetheart Lydia Lubey, and Landen Olsen as Bert, the young "neighborhood sheriff." Jane Hill directs with a fine sense of timing, Michael Foster works his usual magic with the lighting and Raymond Gutierrez's skeletal set design reflects lives stripped to the bone. All My Sons remains incisively relevant today in the chasm between the blue-collar and white-collar worlds, the educated and the manual worker – and all that these things mean for the future of the country. All My Sons plays at Ferndale Repertory Theatre through Feb. 5. Call 786-5483 or visit www.ferndalerep.org. Shows from Feb 10 through 19 are at the Arcata Playhouse. Call 822-1575 or visit www.arcataplayhouse.org. Recommended for ages 16 and up. The one-person show is a tricky bit of business to execute. So it's a boon to the Humboldt Light Opera Company's staging of Shirley Valentine to have Queena DeLany in the titular role. DeLany does a bang-up job for two hours of holding forth without hiccups. Shirley Valentine, which originally came to Broadway by way of the West End in the late 1980s, takes place in 1988, starting in the Liverpool kitchen of a woman who is then, by marriage, Shirley Bradshaw. The 42-year-old wife, homemaker and empty-nest mother arrives home and amiably speaks to us, under the guise of a kitchen wall — clearly a better listener than her working-class husband Joe — about all manner of topics of while having several glasses of Riesling and preparing a dinner of chips and eggs. Shirley has a lot on her mind during the sipping and slicing, griping about the somewhat daft Joe ("he complained about getting jet lag going to the Isle of Man, and we went by boat") and her now-grown children, telling anecdotes of growing up, especially in a school where the headmistress belittled her at every turn. On this day, she's contemplating tickets her friend Jane has purchased them for a fortnight's holiday in Greece. The dramatic peak of the play comes midway through the first act, as the brief asides seamlessly move into a couple of longer remembrances from her life, finally coming to one in which she recalls meeting a rival from her secondary school years later on a rainy day — here DeLany truly shines. The rest of the first act eases into the second, in which naturally Shirley embarks for Greece, and it makes that transition well. The setting and theme of the play — addressing what Shirley calls "finally living the unused life" — is perhaps not a particularly fresh one but Shirley Valentine plays well in SPACE's great intimate setting and DeLany smartly pulls it off. 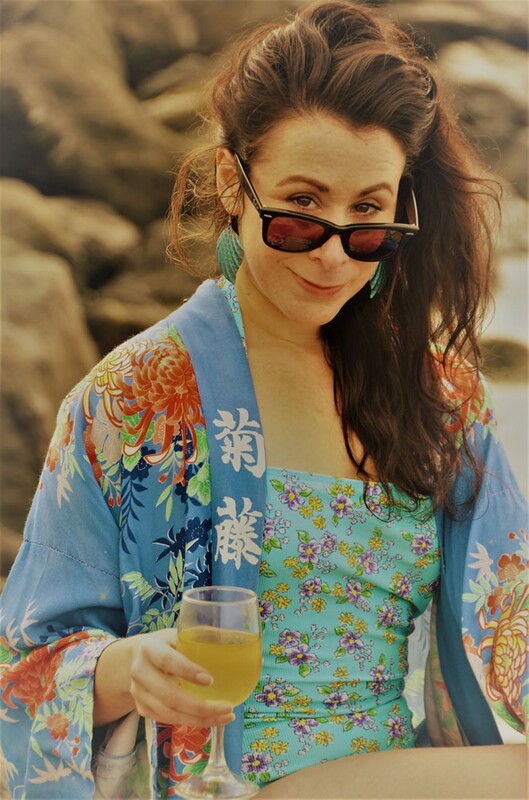 Shirley Valentine plays at the Humboldt Light Opera Company's SPACE in Arcata on Friday and Saturdays at 7:30 p.m. through Feb. 11, with Sunday matinees at 2 p.m. through Feb. 12. For more information, call 630-5013 or visit www.hloc.org. With the strong singing chops of its leads and a game ensemble Oklahoma! 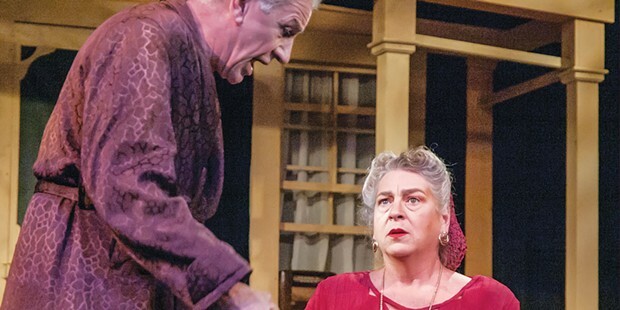 keeps making hay at the North Coast Repertory Theatre on Fridays and Saturdays at 8 p.m. through Feb. 18, with Saturday matinees at 2 p.m. through Feb. 18 and Sunday matinees at 2 p.m. through Feb. 12. For more information, call 442-NCRT or visit www.ncrt.net. Dell'Arte International's annual bawdy, masked Commedia Dell'Arte Show returns to the Carlo Theatre from Feb. 2-4 at 8 p.m. Call 668-5663 or visit www.dellarte.com. This one's for grown-ups only. Bringing the 18th century scientist to stage, Emilie: La Marquise Du Châtelet Defends Her Life Tonight pits the intellect against the heart with wit to spare at the Redwood Curtain Theatre from Feb. 9 through March 4. Call 443-7688 or visit www.redwoodcurtain.com. Hang out with Feet First Dancers for the aerial dance performance Resurrecting Artemis, which "explores the archetype of the wild woman" from Feb. 10-12 at the Redwood Playhouse. 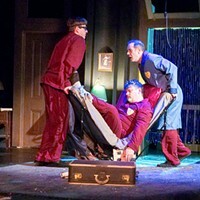 Call 932-0932 or visit www.redwoodplayhouse.com.